"Walk with the Spirits" into Seaside’s haunted history. Guests on our tour will pass by some of Seaside's most spirited places, hearing real ghost stories based on documented research. You may even have your own paranormal experience along the way! Before purchasing tickets for Classes, Evening Shows or Ghost Tours, we highly recommend that you make a plan by looking at the 2019 Schedule so you can decide how you want to spend your time. Decide what classes you are interested in taking and add up the total class hours. If you have a total of more than 5 or 6 class hours and you are also considering attending the Evening Shows or Ghost Tours, you should consider buying a FIRST CLASS PASS instead of Individual Tickets. FIRST CLASS PASS includes General Admission to Speakers & Vendors Area, Up to 10 hours of Classes, Admission to our two Main Events, Two Ghost Tours, a 2019 T-Shirt, and 10 Raffle Tickets as a discounted package. BUY A FIRST CLASS PASS NOW! Tour is 1 hour and 15 minutes long, covering over 20 blocks of the Seaside Promenade and Oceanfront. Tour will start and end at the corner of N. Edgewood St. and Ocean Way St. at the "Greetings from Seaside Mural" on the corner of the Seaside Civic and Convention Center. *INDIVIDUAL TICKETS WILL BE AVAILABLE FOR PICK UP AT THE BOX OFFICE ON-SITE, UNDER THE NAME OF THE PERSON WHO PURCHASED THEM. TICKETS WILL NOT BE SENT TO CUSTOMER. Tour is 1 hour and 15 minutes, covering 15-20 blocks of Downtown Seaside. Tour will start and end at the corner of N. Edgewood St. and Ocean Way St. at the "Greetings from Seaside Mural" on the corner of the Seaside Civic and Convention Center. Tour is 1 hour and 30 minutes long, covering over 20 blocks of the Seaside Promenade and Oceanfront. Tour will start and end at the corner of N. Edgewood St. and Ocean Way St. at the "Greetings from Seaside Mural" on the corner of the Seaside Civic and Convention Center. Tour is 1 hour and 30 minutes, covering 15-20 blocks of Downtown Seaside. 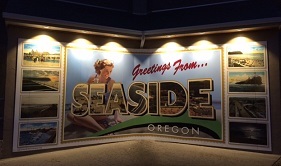 Tour will start and end at the corner of N. Edgewood St. and Ocean Way St. at the "Greetings from Seaside Mural" on the corner of the Seaside Civic and Convention Center.